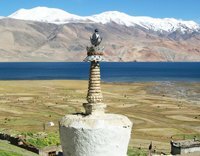 Ladakh is well known as “numerous Passes” or “little Tibet”. It’s a mountainous area situated to the north of India in the state of J&K. Leh is the capital city of Ladakh. It lies at an altitude of between 10,000- 20,000-ft.above sea level. This beautiful Himalayan kingdom is surrounded by chains of high snowy mountains and the Indus river flows through its heart. The presence of age-old monasteries, temples, caves; castles and Stupas all attract many tourists from within India and from abroad. To the east, lies the region of Stod, with Zanskar to the south, Sham to the west, Nubra to the north. Leh is the center point for trade. 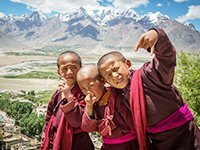 All these regions of Ladakh are well known for their ancient ways of living, unique culture and beautiful landscapes. The people (Ladakhis) are very friendly, honest, peace loving, religious and hard working. Most of the inhabitants are farmers and they love rearing animals such as yaks, zos, sheep, goats, horses, donkeys, dogs, hens and cats as well. Although the people follow different religions, they live in peace and harmony. But in winter, it’s the opposite; it is very cold and the mountain peaks are crowned with blankets of snow. In a sense, the white serene atmosphere is very spectacular. The roads remain closed for some months and things like vegetables; fruits (fresh) are very difficult to obtain in the market. Local vegetables (dried) are available but not for so long. So, most people eat local foods like roasted barley flour (Tsampa), wheat, curd, meat and butter. The only transport link to the outer world during this particular season is by air. As people don’t have any particular work they keep themselves engaged in religious activities and household chores. 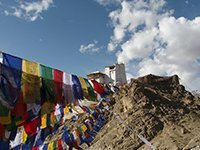 In nutshell, Ladakh is a well-appreciated tourist destination in India, which is known for its unique landscapes, culture and thus is worth visiting. So, Mindruk Trek & Meditation invite you to grasp this opportunity to visit Ladakh and discover its wonders. 1. By air. Daily flight from Delhi to Leh. (year round) With Jet airways, Go Air, AirVistara and Air India.